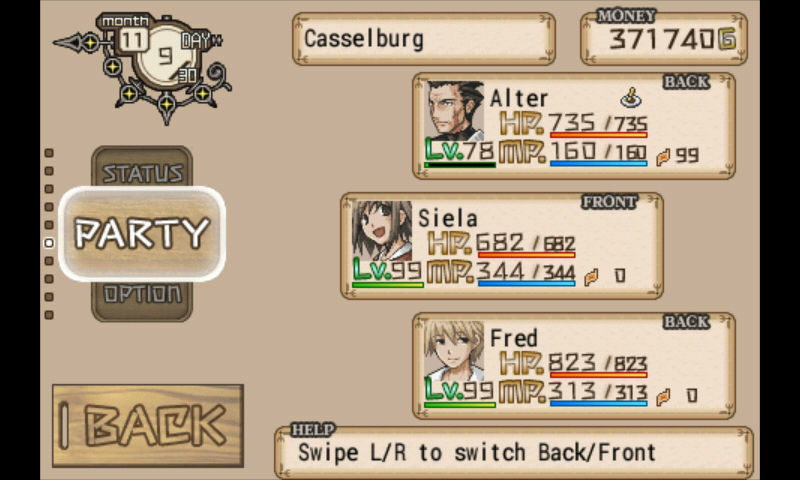 As the story progresses, you will have new members joining your party. Siela is always in the party and she can not be removed from it. She can bring 2 more people to go with her. You can only change party members in your bar. Go to Menu, and scroll up or down until you see Party. Click Party, then it'll bring out the party list. Let's try, replacing Alter with Alfine. We do this by clicking the name of the party member we want to remove. A list of all available names will pop up. 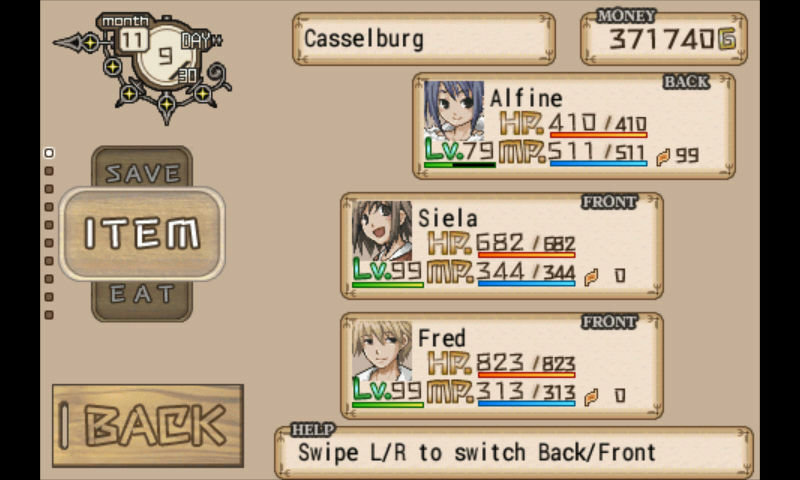 You can tap through the names to compare the original party member and the others. 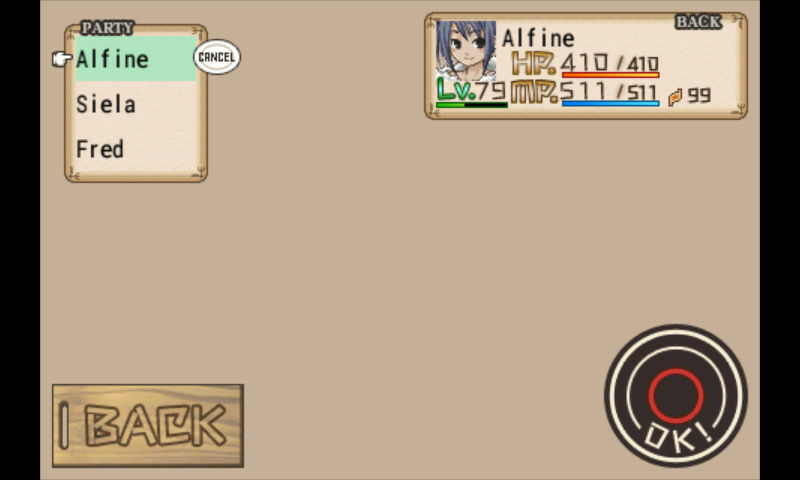 Once decided, tap on the name, in this case Alfine. Then you should see a screen like the picture below. But we are not done yet. If we go Back, then the changes we just did will not be saved. Remember to click OK to save the changes. Once clicked, you'll see a screen like the next picture. That's pretty much done. But I'd like to make one more change. I'd like to bring Fred from the Back position to the Front. I can do this by swiping on Fred's tag from Right to Left. If we want to bring Siela from the Front position to the Back, we should swipe on her tag from Left to Right. We don't need to be in the bar to change their positions. Party members in the front do more damage but at the same time they take more damage. "Who is the best to bring along in the party? ",You might ask. My personally favorite is Fred. If you take Fred off the list, monster HP bars won't show up, and that's kind of inconvenient. Also, I was wondering if he went with Siela often enough, maybe there will be a little love story happening. It never really happened. He gave her a necklace. That's about it. Then I'd pick one more member based on the monsters in the area and the story. The end of the game I chose Siela, Fred, and Milija. Hello Enna! When will Elias and milija join the party? do we have to visit somewhere? 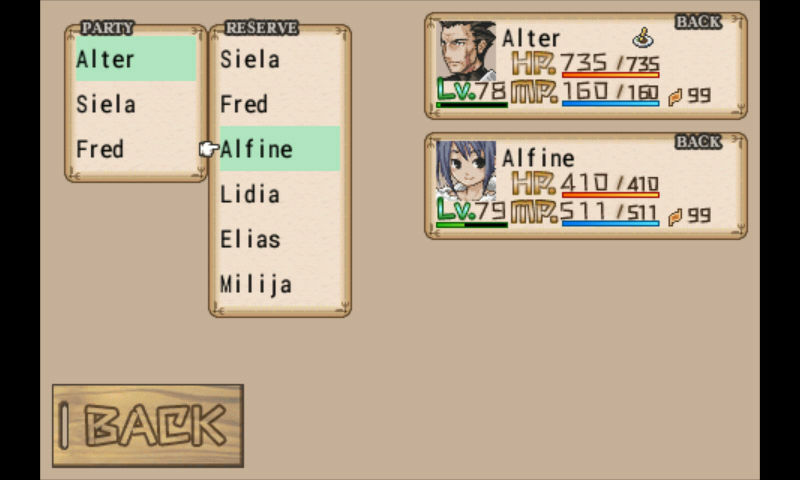 To get Elias to join, you need to speak to Alfine often. Then eventually, Elias will come talk to you. Milija joins really late in the game. She's the last to join you. You'll get her when you go to Purple Forest. you have to be in the restaurant to change your party. if you are outside the restaurant the option will not appear. When Alter will join the party? How? hi enna! just wondering, what do you feed your party? i just basically force fed 150 creme pastas (around the same number of cabbage juices too) between 4 characters, and each went up at most 3 or 4 levels. any recommendations? i've been using creme pastas and otts pies mainly. Heya, I think you are doing very well. Like you said, Fred runs out of stock a lot. It happened to me too. There are some particular food that give pretty good exp but then you can't really make many. The best food is probably whatever you find easy ( or easier ) to make. I often fed Siela the most of the food. She ended up being the first to be level 99. It worked out pretty well though. im feeding them dragon patties and dragon omelets. probably dont need to sell them, because im hovering at $1,000,000. easy to make and gives a lot of exp! Hi Enna.. Can i ask how to unlock the otts cave?.. my character is level 30 but the otts cave not appearing can you help me plss..
Enna, i've talked to Alfine a lot of times but i still can't talk to Elias, right now, i already get Milija.Do you know how to get Elias? Hi, Enna! Who do you think I should level first between Alfine, Elias, Alter, Lidia, and Milija? And which party would you best recommend (based on everything like skills, efficiency etc)? I want to focus on one first, and I'm having trouble deciding. Thanks! Enna, what equipment would you suggest for each character? Enna how do I get more then 3 people in my party and how do I u lock the Otts lake/falls?